As we live in a three-year-old new build property, the walls were white and unadorned. With the bed dismantled and propped against one wall, I started to use the room for illustration work. This gave me the opportunity to see what changes were required, before making unnecessary and costly additions. We found a large, white, modern dining table on Gumtree for £30, which has become my primary drawing desk. There’s also a secondary desk, which my husband uses if he ever works from home. The second-hand desk. Photo by Donna Ford. Below are the other additions I have made over the past six months that have proved to be the best buys. 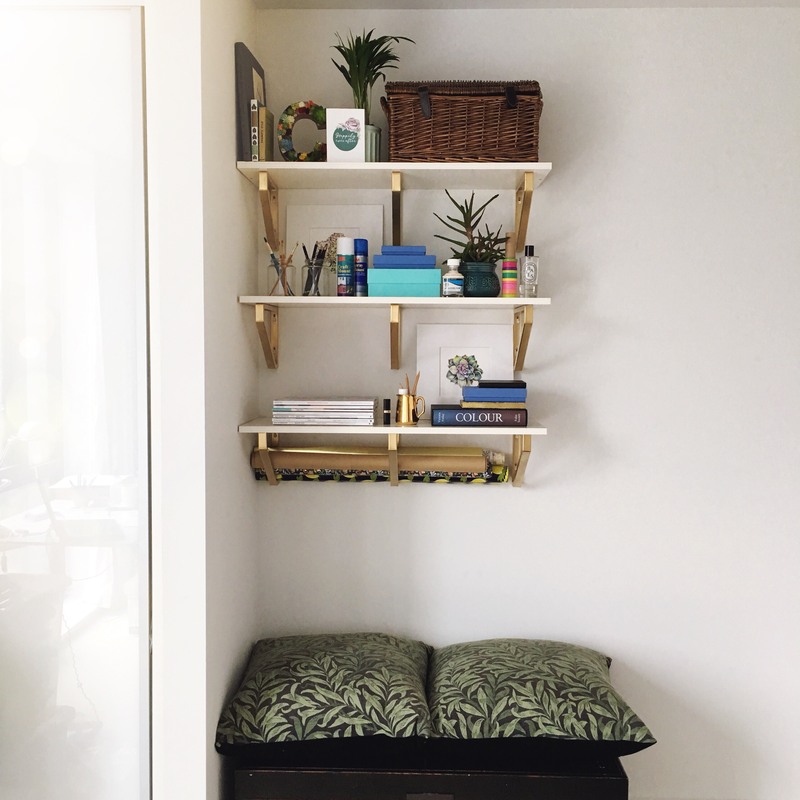 In a compact – nay, skinny – modern townhouse, we have learned the vertical space (ie up the wall) is the best way to add storage. We have to be careful not to overload, but there are huge advantages to keeping floor space clear. I find it especially stressful when the floor is cluttered and I need to climb over boxes. The IKEA Mosslanda shelves cost £8.95 each plus delivery, and have given me the gift of versatility. 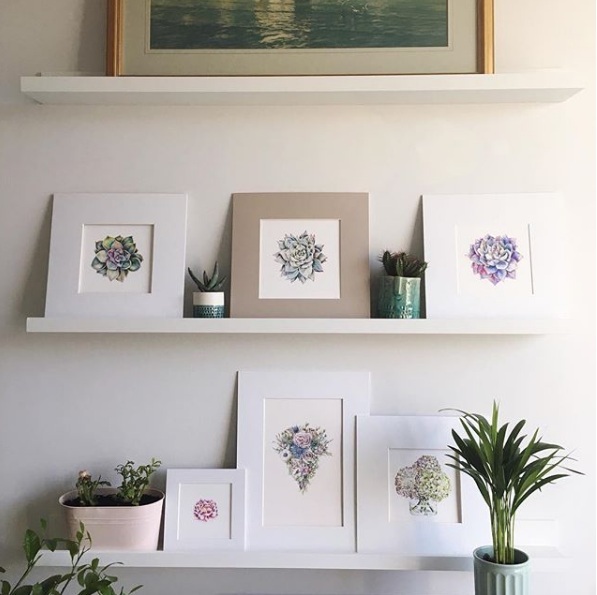 I can quickly whip around frames and mounts to show clients my work to scale. I can easily style up a photograph for Instagram that looks bright and modern, and revert within seconds. We found these shelves very simple and quick to put up. 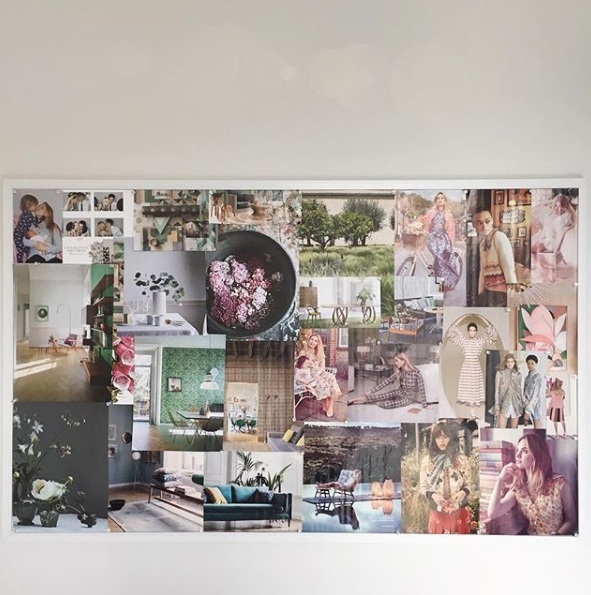 Next is my large pinboard which I had custom made, to precisely match the width of two pieces of Lombok furniture we already owned. Formerly, it was in my bedroom above a chest of drawers and showcased photographs and inspirational images. Was this just preparation for my business launch? Now it rests above our secondary desk in the home studio. It’s just a chair spin away from me while I work. It represents both my ideal client, and my “ideal me”. And of course, it’s ever-changing. Not shown in this picture are my 90-day objectives, pinned up on an A3 sheet, outlining objectives and processes across eight areas of my life. If there’s a moment – alone – where I’m lost for what to do, my pinboard normally provides clarity. 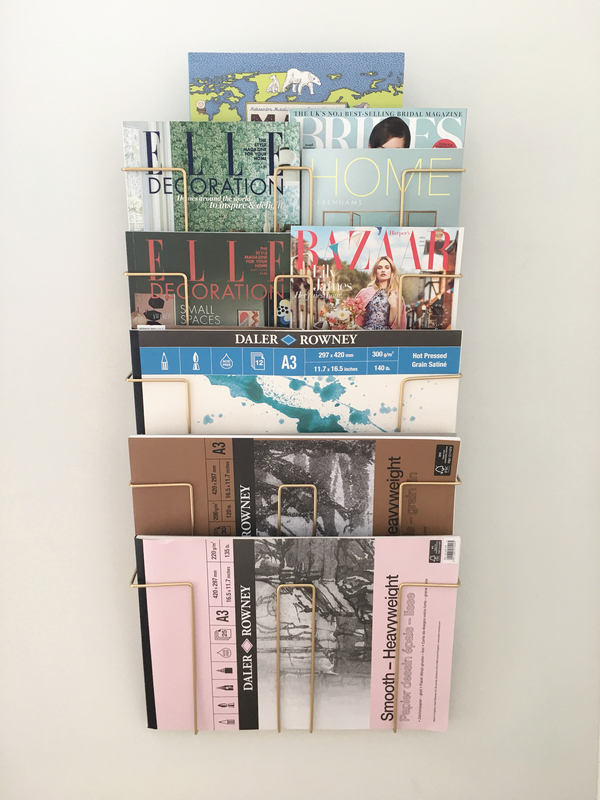 I spray-painted this magazine rack using Rustoleum in Bright Gold. Big papers can be annoying to store. They are expensive and a single crease renders them unusable. It only took a couple of quick coats and was pretty easy. Worthwhile for the result achieved and I was hugely relieved to have the paper pads off my desk space. This is Take Two of Project Shelving. Our first attempt was a droopy failure, and couldn’t cope with the weight of items I really needed to store. Spray-painting these was a bit of a pain. I needed to cover the inside edges as well as the outside, with two coats. It took a while and would probably be easier for someone with the luxury of more space. But, the final result is strong and effective. And I lovely the wrapping paper storage opportunity! The cushions were bought from The Shop Next Door, adjacent to the gorgeous George in Rye hotel. They were the first thing I bought for the house, while still waiting to get the keys. 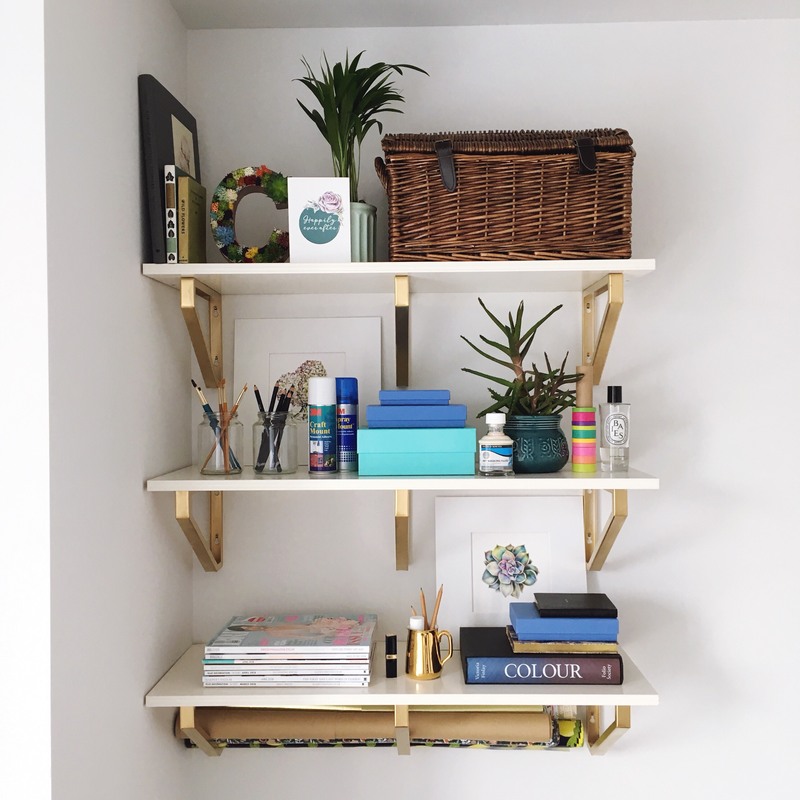 IKEA Ekby Lerberg shelf brackets, sprayed with Rustoleum in Bright Gold. Cushions from The Shop Next Door in Rye. Overall, it is a calm, versatile space that works hard considering its dimensions. I know my business may take various pathways, and the room will need to morph accordingly. But the impact of having “a room of one’s own” is extraordinary. 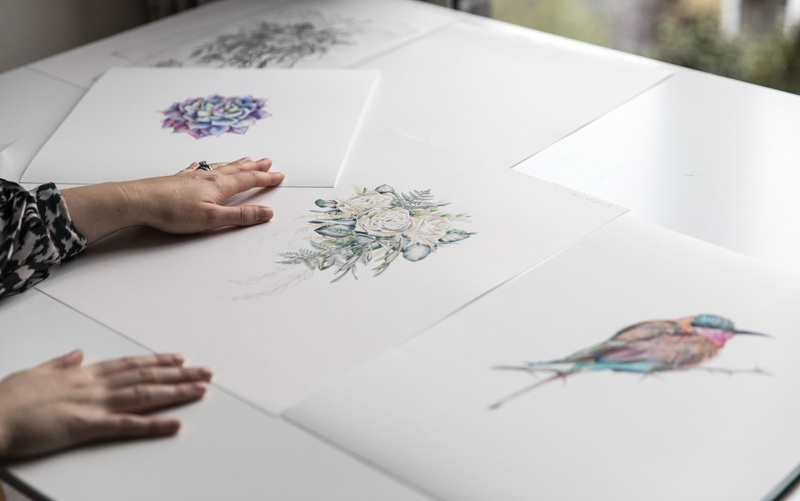 If you like this home studio tour, click through to the Pinterest board, which features all the inspiration shots I used to create the design.